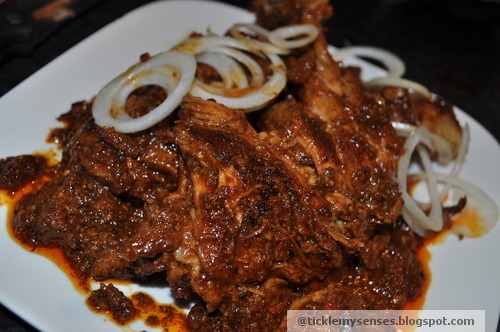 This is my ground version of the Chicken ghee roast. It is hot and spicy, a sure delight to the senses! For a no grind version use the marinade and spice paste mix in simple prawn ghee roast recipe, only double the quantities used. 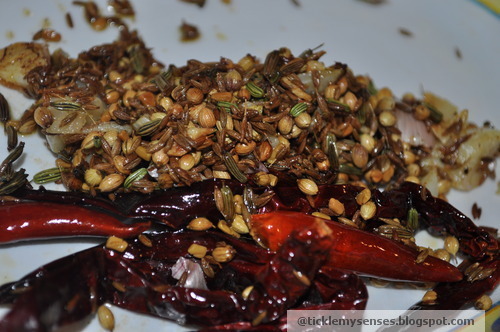 In todays recipe I have ground down the roasted whole spices to make a spice paste/masala instead of using a mixture of spice powders. I usually make it for a Saturday night in...and hubby loves it!! 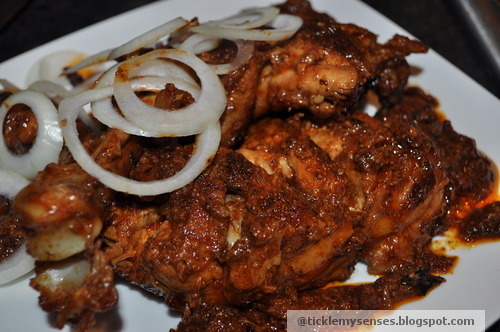 The recipe is very simple....it involves frying chicken which has been previously marinaded, then roasting and grinding down a few spices to make a spice paste, and just putting the two together really.... A brilliant way to jazz up chicken or prawns. It is best served with fresh Basmati rice and a dollop of greek yoghurt. 1. 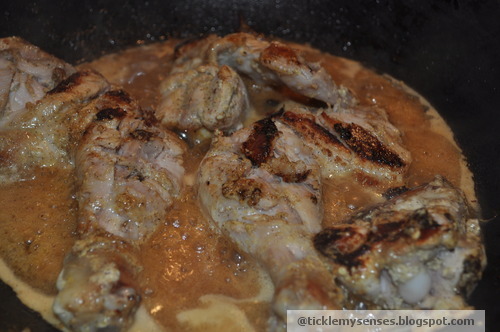 In a large bowl take marinade ingredients, mix well, then add the cleaned and slit chicken to it. Coat chicken well. Cover bowl with cling film. Keep in the fridge for 2-3 hours. 2. In a pan heat a mixture of 2 tsps ghee and 3 tsps oil (or if you feel like indulging use 2 tbsps of ghee instead of oil). When the oil is hot add the chicken pieces and fry for 5 mins on each side, allowing it to brown well. Then add 1 cup of water cover and allow it to cook on a medium flame till 3/4 done. 3. 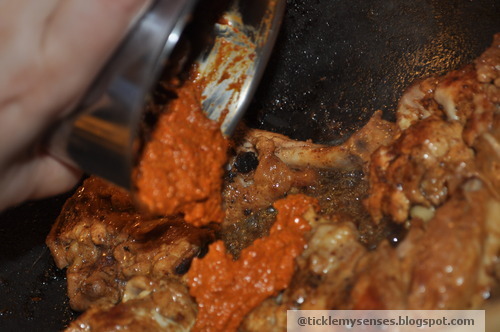 While the chicken is cooking prepare the spice paste. In a pan roast the spice paste/ masala ingredients in 1 tsp ghee in following order-sliced garlic first, then dried red chillies and coriander seeds, then add the rest. Roast together till fragrant. 4. 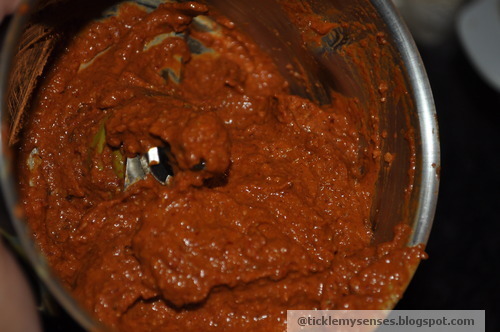 Grind the roasted ingredients to a smooth paste with a little water. Once the chicken is almost 3/4 cooked add the spice paste to same pan in which the chicken is cooking, to the bottom of the pan in the center. 5. Let the spice paste fry in the oil in the bottom and centre of the pan for a couple of minutes before coating the chicken pieces in the ground and fried spice paste. Add another 1/2 cup water. Close the pan and let the chicken cook on a slow flame till done. 6. Check for salt , Garnish with onion rings, Squeeze over 2 tsps lemon juice, serve hot with thick greek yoghurt and steamed basmati rice. It was yummy...confirmed by my hubby too. 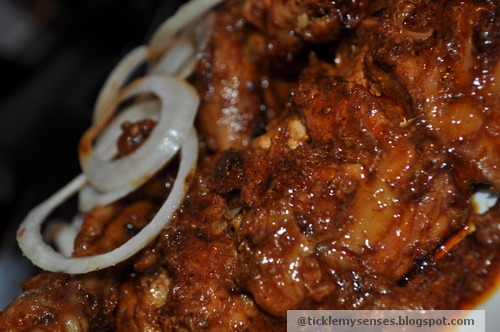 I modified it a bit, used rice flour for the marinade, added tamarind and date paste instead of tamarind paste. It just came out fine. where in blore are you from.....me too from blore....family there now....we go there for holidays....its changed sooo much! Hi, I see you've added fennel seeds (from the picture) for the masala ground paste but forgotten to include the quantity in the recipe. I tried out this recipe and it was delicious! I will be trying out the other recipes soon. I just have one question. In the picture with the spices, what is in the 4th spoon? 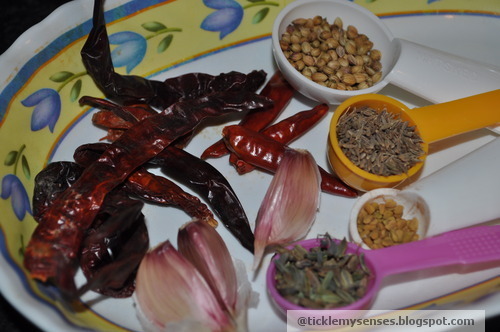 Only cumin, fenugreek and coriander seeds are mentioned in the recipe.